Aqua Teen Hunger Force you crazy mother... They' re back from the dead for another episode. 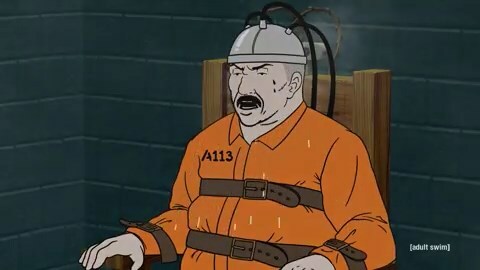 The supposed last episode, which was boring as Hell, was replaced Wednesday with a new last episode that was classic Aqua Teen with highlander immortality and ultra violence. It might be taken down, but an episode after number eight went up on AdultSwim.com here. Fans are speculating there might even be one more episode down the line. The latest episode "The Greatest Story Ever Told, " is a much better episode than "The Last One Forever and Ever (For Real This Time) (We F*cking Mean It), " having cameos from classic characters, gun fights and the voice of Space Ghost. Do yourself a favor and remember that the animation is so cheap that the show could easily come back at anytime.